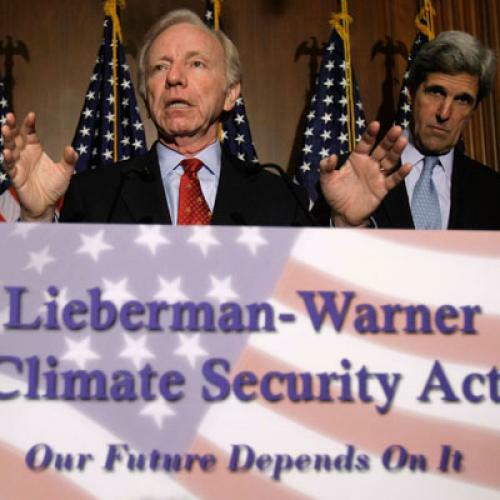 From a distance, it might seem that environmentalists should be crestfallen that the 2008 Climate Security Act--shorthanded as Lieberman-Warner after its lead sponsors in the Senate--went down in flames on the Senate floor on Friday. The bill, which would cap fossil fuel emissions in the United States above a certain level and ask industry to pay more for any excesses, was easily the most aggressive and comprehensive environmental reform ever to hit Congress. But the bipartisan plan to cut U.S. greenhouse gas emissions by more than two-thirds by 2050 came up 12 votes short of cloture. Floor debate was equally contentious. South Carolina Senator Jim DeMint blast e-mailed that "Lieberman-Warner Will Cost SC Jobs, Could Double Gas Prices." After a galling counterpunch from Republican opponents that required congressional clerks to read aloud every word of the 492-page bill, a coalition of 13 green organizations lashed back. "The opposition in the Senate must give up its strategy of denial, delay and disinformation," wrote the groups, including Greenpeace, the Sierra Club, and the Audobon Society. But did they mean it? In the lead-up to Friday’s defeat--a fate that was of no surprise to onlookers--the hedging among greens was palpable. “We like the bill, but we don’t love the bill--yet. That’s our official position,” said Van Jones of Green For All, an organization dedicated to economic growth and “social uplift environmentalism.” Dave Hamilton, Director of global warming and energy programs for the Sierra Club, noted gingerly, “We’re not going to actively oppose this bill.” And Lucy Blake, CEO of the Apollo Alliance, an interdisciplinary group that also stayed neutral in the debate, said flatly, “our allies, whether in the labor movement or environmental community, understand that not all the eggs should be in the Warner-Lieberman basket.” From Democratic Senators Ted Kennedy, Hillary Clinton, Barack Obama, and Joe Biden who didn’t vote for the bill, to the noticeably ambivalent environment groups, the fact is that many people concerned about the U.S.’s environmental policy saw Lieberman-Warner as deeply flawed, a foldable hand in what is proving to be a long round of planetary poker. But delay itself carries a substantial cost--the problem only gets more expensive and more difficult to fix over time. Sir Nicholas Stern, an adviser to the British government on climate change, has written extensively on why inaction is by far the most expensive route. If, for example, the government had passed McCain-Lieberman when gas was priced $2 a gallon, or--as Bush himself had advocated--taken action when oil hit $55 a barrel, today’s energy crunch would be jarring, but manageable, and perhaps even environmentally beneficial. Likewise, emissions cuts will grow steeper the longer cap-and-trade idles. Lieberman-Warner’s two percent cuts in emissions will, by 2010, need to be bumped up to 4.3 percent cuts to keep pace with recommendations from the Intergovernmental Panel on Climate Change. And politically, the moment couldn’t have been more opportune. After decades of debate on U.S. energy policy--its villains, causes and relevance--cringe-inducing oil prices have brought the American people to attention. Recent studies show 60 percent of the country believes “we must take action now or it will be too late to stop [climate change],” and that only 27 percent of the country thinks our energy policy is on a hopeful path. For Washington climateers, the timing of this public pinch--as dozens of vulnerable members fight for reelection in the fall--seemed just right. But the debate within the debate has always been over whether Lieberman-Warner was the right battle to pick, and if greens are better served by waiting for an expected expanded Democratic majority in Congress in 2009. Many signs recommend the latter route. The bill improved on the margin given the failed McCain-Lieberman climate bill in 2003 (though it still didn’t approach the level of support that would have ended Republican filibuster or overridden a veto from President Bush). If this portends an improved chance to pass a bill next summer that has more rigorous standards and perhaps, as Barack Obama has advocated, a cap and auction program to send more money into renewable energy technology--the defeat starts to look like a savvy move for climate action enthusiasts. But policymakers trying to move a debate that only began in earnest in the last five years have grown used to taking two steps forward and one step back. “It’s a little like mud wrestling,” says Blake. “Frankly, we saw this vote in 2008 as a warm-up for 2009.” The history of environmental legislation is incrementalist. The Air Quality Act of 1967--while fairly toothless--set the bar for pollution control legislation that would bear fruit three years later with the passage of the landmark Clean Air Act. In that case, the more flawed bill was passed in order to strengthen a coalition behind the idea of stopping pollution. Similarly, the $125 million allocated for green jobs training in the December 2007 energy bill has ballooned to $60 billion paid out over ten years in Boxer’s Lieberman-Warner amendment. Often, a political defeat can lead to a more strengthened starting point for future negotiations. But many environmentalists feel they will only get one shot at cap-and-trade, and they want to make it count. Ultimately, Hamilton believes a strengthened cap-and-trade bill is inevitable. “The science accumulates, the adverse effect of global warming accumulates and intensifies ... the legislation is going to accelerate,” he says.